Office relationship issues occur every day and sometimes it is caused by poor office etiquette issues. This is a subject that I expect many people will be able to identify with. Almost all of us should be able to say they have experienced some sort of Office Etiquette infraction over their careers. Many have wondered what to do about it. 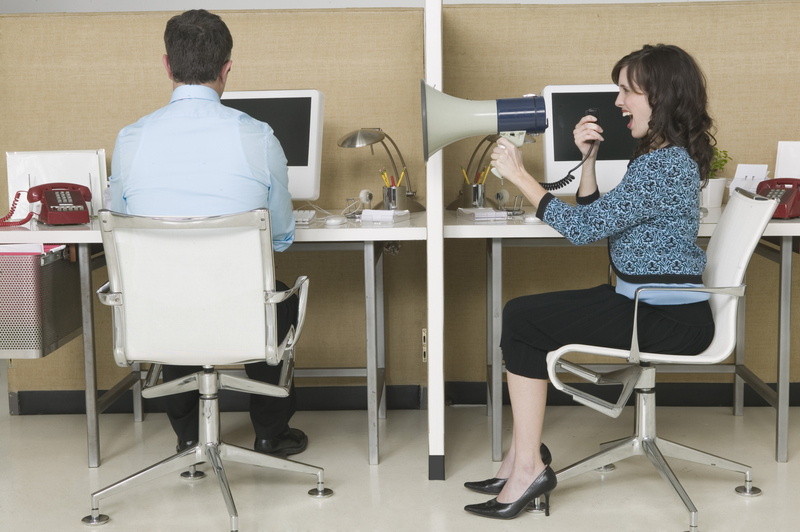 Office etiquette can be simply at the nuisance level. Or it can develop into a full blown war between two people. It can cause broken friendships and even legal consequences. The most important thing to remember is that none of us want to see something escalate beyond our control. We certainly do not want to see someone get hurt, yet it happens every day. These situations can be classed as nuisance items simply because they really don’t get people upset. However they do waste time and they do bother people. With most cubicle type offices these days it is impossible to not overhear your neighbor discussing his or her job. Or even their personal life. It goes without saying that most of us just tune it all out. We focus on the work we are supposed to be doing. Sometimes however it just gets too juicy to ignore. Or they get excited and raise their voices bringing the entire office into the discussion. A polite wave or tap on a desk wall usually does the trick if you are on good terms to begin with. Then there is the office bore, who thinks the world revolves around him or her. They want the entire office to be in on their conversations. I recently experienced a situation were a supervisor would yell over the baffle at one of his people to join him at his desk or ask him a question. Of course the entire office is involved and your work is disrupted as well. Our offices were very close. The only way to have a private conversation is to find a conference room. No one was willing to do anything because he was the boss. They were worried about repercussions of saying anything. Everyone has also experienced this as well. In the office, on the bus, in a restaurant and just about everywhere. I think the worst was in a bathroom one day at work. You know I am sitting there doing my business and someone comes into the next stall and proceeds to ream someone out over the phone in a loud voice. I guess he thought it was private! All of the above are truly nuisance issues until it gets personal. You can put up with a noisy office or someone talking on their phone too loud, however when the office bully gets going and begins throwing their weight around, then it gets to be more than nuisance. Talking to your boss may help, confronting the person may help and ganging up on the person may help as well, however even the office bully has feelings. The point is that you really need to step above the situation, be the bigger person and manage the situation so that it does not get out of hand. It is just to easy to escalate into a shouting match with the inevitable outcome that someone loses their job or their pride. We have al heard about situations were people come back to the office and shoot a few people. This is the absolute worst situation and no one wants to ever see this happen. We all have a breaking point and one needs to take care not to push colleagues and friends over the this breaking point. There is no one solution that will fit all cases. However for most people, good quality communication is the often the best solution for everyone. Try to avoid confrontations were you put someone on the defensive. A constructive environment often helps make a tense situation more palatable for everyone. Keep it professional and make sure that you do not paint the person into a corner. Easy to say, hard to do when you are applying these guidelines in real situations. Never the less, if you can create a win – win situation for all parties, then you will have improved the office and all parties will be better for it. So instead of letting the anger build, and then explode, take some time to figure out the best approach to dealing with your situation and then chose the optimum time to implement it. We would really like to hear from folks who have had to deal with these types of situations. Your comments are welcome, however Spam comments will be deleted. Many people will have solutions that work for them and we would like to hear about these solutions. the thing i really hate is people talking loudly on cell phones when there are other people around. do they want everyone to hear what they are saying or are they deaf. for a lot of people cell phone etiquette is non existent.